Finding ancestors one step at a time. Long have I heard stories about George Washington having commissioned a weathervane from Joseph Rakestraw, my seventh great-grandfather. If true, this would be a pretty cool addition to the family history. But how do I prove or disprove it? I began by looking for information on George Washington’s weathervane and any mention of a Joseph Rakestraw. As it happens, Washington wrote a letter to a Joseph Rakestraw of Philadelphia on July 20, 1787, requesting that a weathervane be crafted. This weathervane was to have the shape of a bird with an olive branch in its mouth.1 A weathervane of that description can be found on the cupola at Mount Vernon today. 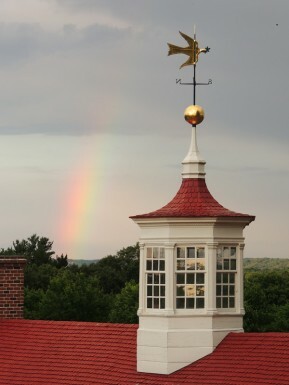 Cupola and weathervane at Mount Vernon. Courtesy of MountVernon.org. Now, I have been researching Rakestraws for a long time. In 1787, there were about five or six Joseph Rakestraws in and around Philadelphia. Most likely all related somehow, but still, how do I know which one fashioned the weathervane? As I continued my research, I found that the Joseph Rakestraw to whom Washington had written was not a metalworker, he was a carpenter.2,3 This narrowed it down some. I know at least two Josephs were carpenters and one was a printer. I am unsure about the others. Of the two I know to be carpenters, one had moved out of Philadelphia in 1786, leaving only one that I know for sure was a carpenter.4,5 This one is the one I believe was my seventh great-grandfather. Joseph Rakestraw, who was married to Rachel Ogilby and died in 1794, was the man whom Washington commissioned to create a weathervane for Mount Vernon. I believe this to be the same Joseph Rakestraw who is my seventh great-grandfather, but I am still trying to prove that his son Joseph and my sixth great-grandfather Joseph, who married Rebecca Gilbert, are the same person. The Papers of George Washington Digital Edition, ed. Theodore J. Crackel. Charlottesville: University of Virginia Press, Rotunda, 2008. Accessed 07 October 2015. Manca, Joseph. George Washington’s Eye: Landscape, Architecture, and Design at Mount Vernon. Baltimore, Maryland: Johns Hopkins UP, 2012. Print. Greenberg, Allan C. George Washington, Architect. London: Andreas Papadakis, 1999. Print. Walton, William. A Narrative of the Captivity and Sufferings of Benjamin Gilbert and His Family, Who Were Taken by the Indians in the Spring of 1780. Third Edition. Philadelphia: Printed by John Richards, 1848. pp. 222-223. Ancestry.com. U.S., Quaker Meeting Records, 1681-1935 [database on-line]. Provo, UT, USA: Ancestry.com Operations, Inc., 2014. Haverford College; Haverford, Pennsylvania; Minutes, 1768-1789; Collection: Philadelphia Yearly Meeting Minutes. Moss, Roger W. “Rakestraw, Joseph (c. 1735 – D. 1794).” Philadelphia Architects and Buildings. The Athenaeum of Philadelphia, 2015. Web. 16 Oct. 2015. Karsch, Carl G. “The Yellow Fever Connection.” Ushistory.org. Independence Hall Association, 4 July 1995. Web. 7 Oct. 2015. Ancestry.com. U.S., Quaker Meeting Records, 1681-1935 [database on-line]. Provo, UT, USA: Ancestry.com Operations, Inc., 2014. Haverford College; Haverford, Pennsylvania; Births and Deaths, 1754-1806; Collection: Philadelphia Yearly Meeting Minutes. Ancestry.com. U.S., Quaker Meeting Records, 1681-1935 [database on-line]. Provo, UT, USA: Ancestry.com Operations, Inc., 2014. Swarthmore College; Swarthmore, Pennsylvania; Women’s Minutes, 1744-1765; Collection: Philadelphia Yearly Meeting Minutes; Call Number: MR-Ph 561. This entry was tagged 52 Ancestors, Carpenter's Company, George Washington, Joseph Rakestraw, Mount Vernon, Pennsylvania, Philadelphia, Rachel Ogilbey, Rachel Ogilby, Rachel Rakestraw, yellow fever. Bookmark the permalink. The clue is to check your Quaker records. Joseph and Rebecca were “dismissed for marrying contrary to disipline – too near relative” 29 11th mo. 1785. Northern District.” So go searching for how they were related and you’ll find Rachel Ogilby’s mother was a Gilbert. I just checked and I don’t have the record you mentioned. I tried searching on Ancestry and so far have been unable to find it there. I’ll look again when I have more time. Last year, I did find a document that shows Joseph and Rachel (Ogilby) Rakestraw’s children. I’ve done a chart to show how Joseph Rakestraw and Rebecca Gilbert are related. They are second cousins. I need to start posting again. I’ve found quite a bit of information on Rakestraws and Gillilands while I was having knee problems last year and unable to do much else. There is another clue that suggests Joseph Rakestraw (Rachel Ogilby) is the Rakestraw that made the weathervane. Years ago, when I was working on Rakestraw genealogy, I did some research with a woman who descended from the daughter of Joseph Rakestraw (Rachel Ogilby), Hannah. Hannah married Abraham Colladay. Abraham was one of the executors of Joseph’s will. When she was a little girl she was fascinated by her grandmother’s coloring book. Someone had pasted blank papers on an old inventory book so her grandmother could color. She could see writing under the coloring pages and always wondered what they were about. When grandmother died, she inherited the book. She told me about how out of curiosity, she soaked the book and removed the colored sheets. Under them was a book kept by Abraham Colladay for his business and an inventory of who still owed money to the estate of Joseph Rakestraw. A couple of the entries were for work on Mt. Vernon. I was excited and we told Mt. Vernon about it but they didn’t seem interested. She was so glad that when she soaked the book, she hadn’t ruined the writing. I think I have some copies of that somewhere. So excited! I just found the source about Joseph and Rebecca’s marriage. It was not in Hinshaw’s – but in a some film I ordered in from the Family History Library. PA MM – No Dist. I wish I could see the original entry book. Time travel as close as your local cemetery.